In a world where information technology and data are quickly changing nearly all aspects of our lives, one thing remains constant — our right to our identity. While this fundamental human right remains unchanged, technology has changed how we identify ourselves to participate effectively in the economy, access public and private services, and engage in a digitized society. The World Bank’s global dataset shows that an estimated one billion people around the world lack official proof of their identity. This gap is most concentrated in developing countries, among women, and among the poorest in society — precisely the groups that are most economically marginalized. Closing the digital identity gap can contribute to an inclusive economy. Given this backdrop, governments around the world are carefully considering whether to make investments in digital identity systems, and if so, how they should be designed and governed. These decisions are not easy. Investments in technologies involve both cost and risk. ID issuers need to weigh the benefits. Released today, the McKinsey Global Institute study “Digital Identification: A Key to Inclusive Growth” breaks new ground with a complete picture of the economic impact that Good ID systems can deliver. McKinsey Global Institute, with assistance from Omidyar Network and other advisors, has carefully estimated the economic impact of digital ID by modeling six key roles, including consumer interaction with commercial providers, employers, public services, and asset owners. Key gains include higher labor force participation, time savings, agricultural productivity, and access to employment. Projected against a carefully selected set of developed and developing countries, the study identifies a massive 1.7 billion increase in the number of people with financial services, 110 billion hours saved through streamlined government services, and a 20 percent reduction in payroll fraud. In developing countries, these gains can add up in value to six percent of GDP. The report also makes it clear that these gains are not automatic. Good digital ID programs, implemented thoughtfully, offer significant inclusion benefits and higher standards of privacy and security with limited costs. They do require a focus on both ID system design and the ecosystem, or enabling environment, for the ID system. At Omidyar Network, our view is that the economic potential of ID cannot be realized unless it empowers people and protects their privacy. Privacy leads to trust, which is essential to getting the high adoption rates that drive the high economic impacts the study has identified. Many others share this view — not only countries and regions that have adopted data protection and privacy laws, but developing countries as well. The top concern in ID4Africa’s annual survey of the key stakeholders of identity systems in Africa was data privacy. 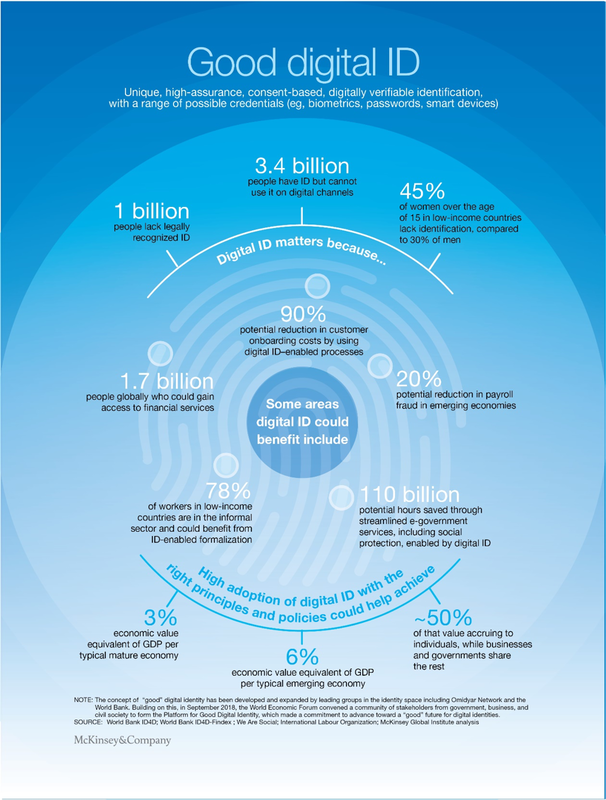 Given the magnitude of potential economic gains from the deployment of digital ID systems, this report makes the economic case stronger than ever for implementing “good” features in a digital identity system. Privacy, security, and user-control features in technology and the ID ecosystem offer better outcomes for individuals, who ultimately accrue half of the total value generated by digital identity. There is much to be done to fulfill the empowerment promise of universal digital ID. We think the McKinsey Global Institute study is an essential reference point for governments and private issuers who are designing and implementing ID systems. Read the full report at mckinsey.com/digitalid.